I snatched this dress up for .99 cents with the intention of making a a Maxi Dress. I cut the yoke off and made a casing for elastic... but I didn't like how it turned out. I thought the length was a little weird on me #petite :) so I decided to just make a skirt. I added elastic to the original waistband of the black fabric and cut 13" off the length. I finished the new and shortened edge with a rolled hem. And, just for fun... I made a rosette brooch from the plaid scrap. 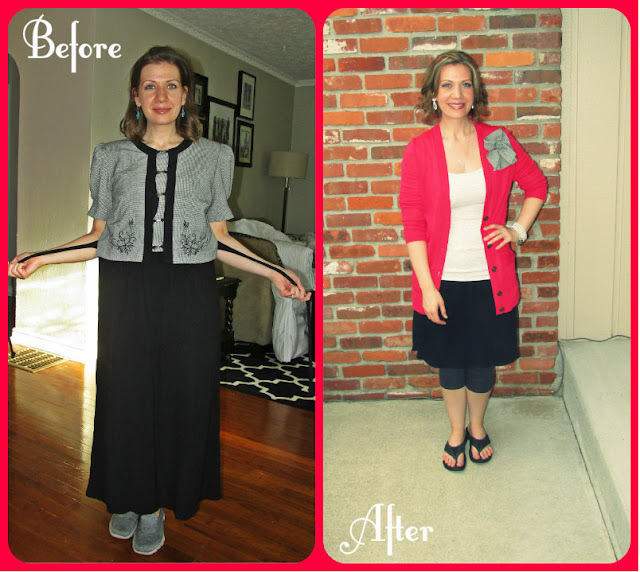 If you want to see how this was the refashion that I nearly gave up on, click here to see my original post. Way to stick with it. I have had projects that just wont cooperate too. So pretty! I love the new skirt. Great job.